Nature, recreation and culture: these are Périgord in a nutshell. 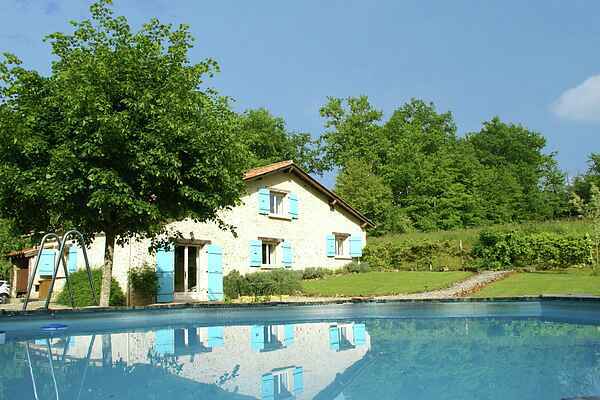 This holiday house near Manzac-sur-Vern (3 km) with its round, private swimming pool will definitely de-stress you. The house is located at a beautiful spot in the forest so you can benefit from the sun all day long. Your privacy can only be \"disturbed\" by deers in the area. Isn't that wonderful? The original beamed ceilings and the atmospheric stone interior walls give the house a cozy atmosphere. Do you feel the urge to be active during your vacation? Make a beautiful canoe trip on the river L'Isle (canoe rental 11 kilometers away). In Manzac you can play tennis, or you can go golfing at the golf course (eighteen hole) of Périgueux (17 km). Périgueux is also interesting because of its many historic monuments. The cathedral of Saint-Front, with its beautiful towers, already catches your eye from far. Go shopping and visit museums (tobacco and wijmuseum) in Bergerac (39 km). Taste the best wines, strawberries, walnuts and all other delicious food products available here. Also the prehistoric remains at Les Eyzies (54 km) are worth a visit.